"This is a wonderful, refreshing drink that can be used for receptions, parties or even holiday get-togethers. This is decidedly different from your usual punch. It and can be stored in covered jars for several days in the refrigerator." 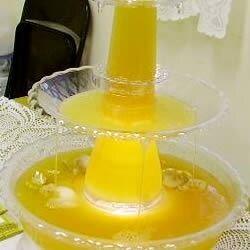 In a 2 gallon punch bowl, combine orange juice concentrate, pineapple juice, lemon juice and sugar. Stir in water. Don't miss out on this budget-friendly, tropical flavored punch. Very delicious and refreshing. Its easy and everyone loves it! I just used lemon-lime soda instead of the water/lemon juice/sugar, and it turned out great!! Not what I expected. I followed the recipe to a T. I am not sure why my guests did not gobble it up. Maybe they had to many drink selections. It tasted very "pineappley". We used this recipe for my parents' Golded Anniversary celebration. My advice: make a lot; it was a smash!